Synopsis: Meet the Bench Warmers – Danny, Crystal, Angie, Omyr, Leanne and Cody. They’re the new basketball players at Robdale Primary and according to hot shot Greg ‘The Goat’ McGriffin, they don’t have a chance of winning a lunchtime game. But when the gang are picked as part of the school squad things start to look up. SWISH! Can the newbies shake off their name in the upcoming interschool comp, or will it be just another reminder of where they really belong? This new junior fiction series, written by David Lawrence, has been produced in partnership with Basketball Australia. While the linking up with the sporting association means there are plenty of tips and terms for basketball lovers to pick up on, the book is fun and humorous and certainly still suitable for readers who have never shot hoops in their life. In fact, the main character, Danny, starts off the book as a kid who is far from sporty – instead, he loves gaming and reading comic books, and his parents have to try and force him out of his room and into the fresh air. This beginning lifestyle, and Danny’s subsequent discovery of a passion for a sport in the first time of his life, is a clever strategy that means the series will appeal to readers who spend their time on lots of different pursuits, not just natural sports enthusiasts. As well, while the protagonist is male, the book’s supporting cast of characters include plenty of girls (who range from confident to shy personality types) who are beasts on the basketball court. The support characters are also multiculturally and physically diverse. As such, the series should be thoroughly enjoyed by both sexes and kids from a wide range of backgrounds. The author has made sure that there are plenty of laughs throughout the book too. Some stem from Danny’s family and the kids themselves, but many arise at the expense of the students’ obnoxious and glory-hogging school principal, Miss Take (one of many “punny” names in the book), as the children find ways to deal with her unfair behaviour and nasty comments. 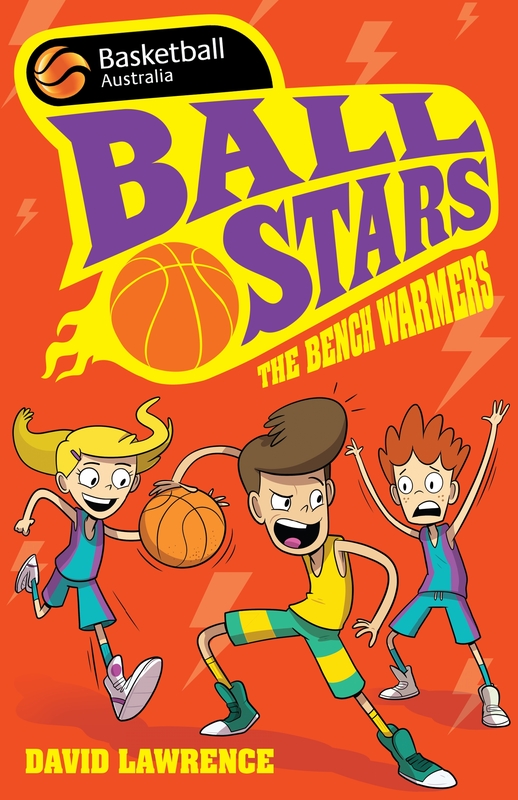 Ball Stars: The Bench Warmers explores lots of great topics and themes that parents and teachers will find helpful in prompting discussions. For example, Danny moves to a new home and school at the start of the book, so the text deals with issues of finding your place, coping with change, and making friends. Furthermore, on the basketball team the children learn that each player has their own strengths and brings something helpful and interesting to the mix, including the character of Cody, who isn’t so hot on the court but who is an incredibly funny and talented commentator on the sidelines. Other themes explored throughout the book include bullying and standing up for yourself and others; learning from mistakes; familial relationships; working together to achieve goals; the importance of commitment and hard work; and teamwork and sporting behaviour. In addition to the text, the book is punctuated throughout with cartoon-style pictures of the characters and happenings, illustrated by James Hart. These not only break up the text for readers, but also add more humour to the story (the pictures of Miss Take, in particular, are very funny, as is the one of Danny’s dad wearing his old, but now too-tight, high-school basketball uniform). There are some full-page illustrations throughout the book, as well as smaller pictures. Kids who are inspired to take up the sport after reading Ball Stars: The Bench Warmers (and it’s likely to be quite a few) can turn to the back pages of the books for some helpful information. There is a full page of dribbling tips, and another on shooting tips. Basketball Australia’s Aussie Hoops program (an official program for 5-10 year olds) is also mentioned, so kids can straight away see an opportunity to get involved with the game if they’d like. ← Tonya Alexandra – magic happens!